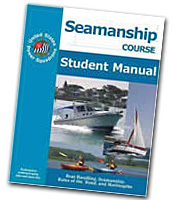 Seamanship – is a natural first/next step in building a foundation for confidence and competence in safe and enjoyable boating on the water. It extends the knowledge and skills of the boater in handling and maneuvering a vessel, either sail or power. The course provides a better understanding of how boats behave under various conditions including close quarters and open water operations. Knowledge and skills are increased in the areas of anchoring, emergencies, rules of the road, and marlinespike/basic knots. Appendices include information to safe operation in waters of our neighbors to the north and south, Canada and Mexico.. The course content and our coastal navigation courses should help in preparation for completion of the US Coast Guard licensing examination. An On-The-Water component enhances the learning experience. This course is available on line at the University of West Florida. Find this advanced course near you!